This posting isn’t so much any thing I’ve got to say on this subject, but rather a collection of ideas from others who are talking about what libraries should look like in schools. I love books and will probably always love them. But, increasingly I am getting used to reading digital books and like the ability to take hundreds of books and scholarly articles with me anywhere I go and be able to put up a resource and email it to a colleague, instantly pull up quotes or data to support a position, or send a link via Twitter to something I know other teachers will find interesting. In short, within a few years, libraries won’t look anything like what we’ve been accustomed to in the past. And ironically, they might actually be more effective in encouraging literacy by being more versatile and attractive to students seeking learning spaces for a variety of purposes. The role of librarians has changed too, from being people who once catalogued books and provided services like maintaining databases and teaching research skills, to now having to be uber-information experts and fluent in a variety of digital literacies, with an ability to help students sift good information from poor, use online tools and teach critical media literacy skills. Teacher-librarians are probably more indispensible now than ever, but need an entirely different set of skills. 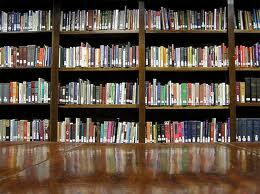 The following links explore the possibilities for future libraries.